We all know very well that mobile devices are simply getting better day by day, which simply allows us to enjoy our favorite hobbies is a reality. Hence, now according to the latest reports, a hacker has managed to run Windows 10 and COD: Modern Warfare 2 on OnePlus 6T. We all know that mobile devices are simply getting better day by day, and simply allowing us to enjoy our favorite hobbies is a reality. As more and more users are simply making use of video games on their smartphones, and for this, we should thank to the convenience and portability offered by the smartphone manufacturers in their devices. As we all know very well that nowadays we could enjoy video games on an Android phone almost as if we were in front of a computer. 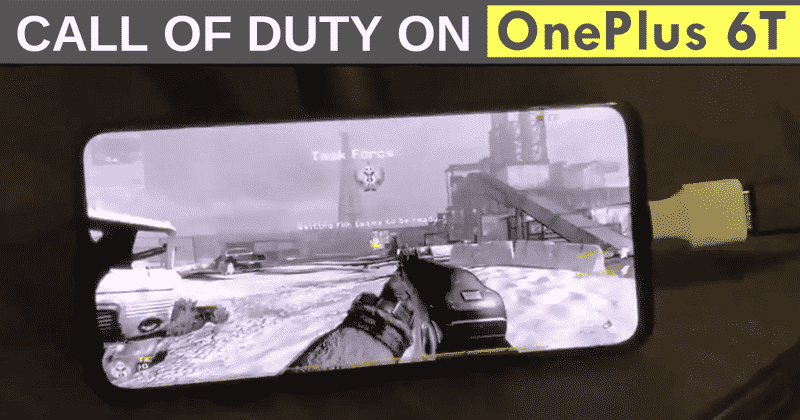 Hence, now according to the latest reports, to make this situation a reality, a Dutch hacker has managed to run the PC version of Call of Duty: Modern Warfare 2 in a OnePlus 6T, which is, of course, an Android smartphone. The 25 years old, Dutch hacker, who is known as Bas Timmer has managed to port the tech giant Microsoft’s latest computer OS, of course, Windows 10 to run on his OnePlus 6T smartphone. Moreover, the Dutch hacker, who is known as Bas Timmer has not only been able to demonstrate that you can run the tech giant Microsoft’s operating system on a smartphone, but you can also enjoy real games like Call of Duty: Modern Warfare 2 and much more. However, for now, he has not yet used any other smartphone, other than the OnePlus 6T, a device that comes with a flagship processor of Qualcomm, of course, the Snapdragon 845 which is best rated by critics during the past year. As we already know that the OnePlus 6T is one of the best smartphones in terms of price-quality in the market, especially if we are looking for excellent performance as well as outstanding autonomy. Hence, the Dutch hacker, who is known as Bas Timmer decided to share his achievement on Twitter, although the performance of the game is not too stable, despite being a game which is released in 2009, but, we understand that only the fact of running a game of these characteristics on an Android smartphone is quite an interesting achievement, especially if we consider the age of the user and the fact that he has managed to do everything without the help of anyone. While the hacker, Bas Timmer has stated that he intends to continue with this project, simply to bring more perfection, so that in future the game could be run with greater stability. So, what do you think about this? Simply share all your views and thoughts in the comment section below. And if you liked this post then simply do not forget to share this post with your friends and family.